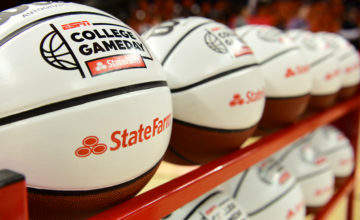 College GameDay Covered by State Farm is making a second visit to Kentucky this season, as the show heads back to Lexington on Saturday, Feb. 16. The traveling pregame college basketball show hosted by Rece Davis with analysts Jay Bilas, Seth Greenberg and Jay Williams, will originate from historic Memorial Coliseum on Kentucky’s campus, beginning at 11 a.m. ET on ESPN. The show precedes the Saturday Primetime Presented by H&R Block matchup between the top two teams in the SEC – No. 1 Tennessee and No. 5 Kentucky (8 p.m., ESPN). Bilas will join Dan Shulman and Maria Taylor to call the Sonic Blockbuster game. This will be GameDay’s ninth visit to Kentucky, and the 18th time the Wildcats have appeared in a game that College GameDay has originated from – tying Duke and UNC for most appearances. The College GameDay site will be announced one week prior to the show, ensuring visits to sites of top storylines and games appearing on ESPN networks each week.